When a goose falls out of formation, it feels the drag and resistance of flying alone. It quickly moves back into formation to take advantage of the lifting power of the bird right in front of it. 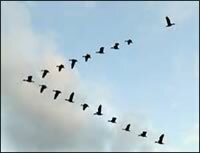 Lesson: If we have as much sense as geese, we stay in formation with those headed where we want to go. WE are willing to accept their help and willing to give our help to others. ARE YOU STAYING STRONG AND ON COURSE TO HELP WEA ACCOMPLISH CHANGE? ARE YOU GIVING YOUR SUPPORT OR JUST EXPECTING WEA LEADERS TO DO IT ALL?